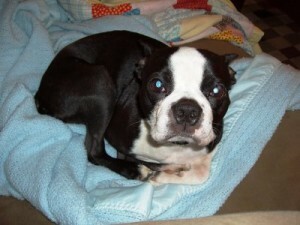 Dodger - Save-A-Life, Inc.Save-A-Life, Inc.
We wanted to give you an update on Monte (who weve renamed Dodger), the Boston terrier with juvenile cataracts we adopted from your organization. We are happy to report he is doing wonderful in his new home. Hes a sweet, smart, funny, energetic little boy who loves to play with his older Boston brother, Cricket, and cuddle with mom and dad on the couch. Thank you to your organization (as well as all the people who donated to his cataract surgery) for giving this little guy a chance. He’s a great dog and we couldn’t be more in love with him.